The most awaited result of "Vijaya Bank Credit Officer 2018" exam is out. Team BankExamsToday wishes all the successful candidates Heartiest Congratulations as your hard work and persistent efforts finally paid off. Now, you must be apprehensive about the Interview which is the last stepping stone for the recruitment process. Fret not!! We are here to help you climb the ladder of success with our Interview Study Material and Strategy. 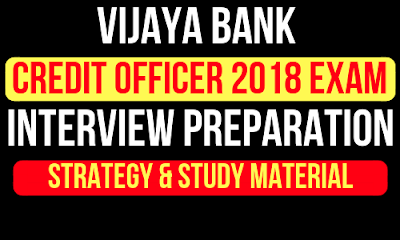 Watch our Vijaya Bank Credit Officer 2018- Interview Preparation video lecture on YouTube at 5:30 pm today.